In this four-part series, we’re looking at how to use a bullet journal to change your life. In part one we learned about what a bullet journal is, how to set one up, and that it’s ok to do it badly. In part two, we looked at how to use a bullet journal to build better habits. 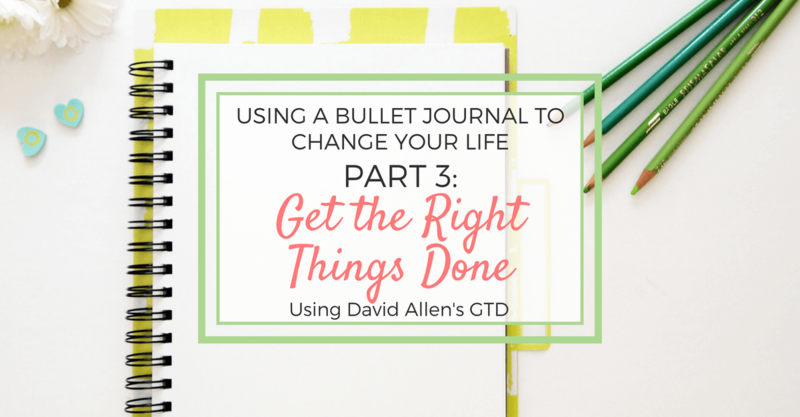 Today we look at using a bullet journal to get the right things done using GTD. One of the constants of life is that there is always something that needs to be done. Or something that you want to do, or that you want to learn. And that can be completely overwhelming. In a world where we have instant access to almost any information, it’s important to learn how to filter out the noise, to stop being overwhelmed and focus in on getting the right things done. But what are the right things? The right things are different for everyone. They are the things that matter most to you. Not the things that matter most to your friends or to your neighbor or to the celebrities on TV. The things that matter most to YOU. You don’t build a happy life by chasing after what matters to someone else. You can spend every waking minute of your day busy and active, but if you aren’t spending that time on the right things, you’re more likely to feel worn out, burned out and unfulfilled. But spend your time on the right things, and that is the path to a meaningful, purposeful, happy life. Remember, happiness is the joy you feel striving for your potential. One of the reasons that I recommend the bullet journal system is because identifying just-right-for-you things is built into the system. When you take the time to write things down you’re more mindful of how you’re spending your time. And if you find yourself writing the same task over and over because you just aren’t getting around to it, before you move it to the next day or month, you ask yourself “is this still worth my time?” If the answer is no, drop it and move onto something that is worth your time. If the answer is yes, ask yourself why you’re not getting it done and see if you can break it down into even smaller steps. Here are 17 ways to use the bullet journal to get the right things done and be more productive. A few years ago I learned a productivity system that was based on David Allen’s Getting Things Done (GTD). While I don’t use the full GTD system, I’ve found a few parts of it very helpful and it integrates well with the Bullet Journal system. In GTD, any multi-step item is considered a project and not a task. For example: ‘empty the dishwasher’ would be a task, but ‘get a haircut’ would be a project because you need to make the appointment, arrange for a babysitter, decide on a style and color, and then go to the appointment. The GTD method teaches you to think in terms of small actions to make progress. You ask yourself, “what is the very next action that will move this project forward?” and that is what you write on your to-do list. When you write it on your list, you write an action word first – feed the dog, call mom, buy masking tape, meet with church ladies, pull file of last year’s taxes, etc. The to-do list is called a Next Actions list – because it contains the next actions you need to do to move all your projects forward. In GTD, the Next Actions list is divided by context – based on where that action needs to be completed: Computer, phone, home, errand, delegate/discuss/think. So, when you find yourself on the computer, you’ll have a list of the actions you need to do on the computer all grouped together. Same with phone calls, errands and the rest. There are other parts of the GTD system too and here’s a breakdown of how the two systems work together. In my bullet journal, I use the weekly log to see my week at a glance. It contains my calendar with all the date and time specific appointments for the week, my routine tasks, and date specific tasks. This is also where I list my dinner meal plan, the current projects I’m focusing on that week and my GTD Next Actions list. The Next Actions list items don’t have a specific day or time that they need to be completed, but I do want to get them done in the very near future. Each night when I’m planning the next day, I’ll look over the Next Actions list and choose a couple action items to add to my daily log based on whatever context I will be in. If I’m grocery shopping, I’ll look over my errand list and see what else I can do while I’m out. If I’m paying bills, I’ll see what else needs to get done on the computer. I also added a ‘waiting’ section for the items that I have delegated or completed my portion of, but that I’m waiting for someone else to take action on – like a reminder about school pictures coming back from school soon, or that I asked my teenager to think of a thank you gift for her teacher. This reminds me to follow up in a timely manner. Each week as I’m making a new weekly log spread and migrating tasks, I conduct a weekly review, checking in on what I’ve completed, what needs prioritizing, migrating tasks, determining if unfinished tasks are no longer worth my time, etc. This is when I try to finish off my next actions list. I also do a brain dump in preparation for the next weekly log. A brain dump is simply listing (or drawing or mind mapping) all the things swirling around in your mind onto a fresh page. Just getting it out of your brain helps you organize and plan and free up space in your working memory. When it’s all written out, you can look more objectively at everything you’re carrying on your load, ask yourself if it’s a reasonable load, prioritize the important stuff and see what you can cut out. 5. Run your brain dump items through the Eisenhower Matrix. You can use the Eisenhower Matrix to determine priorities. Essentially, it’s a grid with the columns “Urgent” and “Not Urgent” across the top and “Important” and “Not Important” along the sides. For each item from your brain dump, you decide if it is important or not important and urgent or not urgent and put it in the proper place. Items with top priority are the Important and Urgent items are Level 1. Level 1 items are the “do today” items. Items that are important but not urgent are Level 2 and get put in the next actions and current projects lists. Items that are not important but Urgent are Level 3. Those you try to delegate or do quickly during non-peak working hours. Things that are not urgent and not important are Level 4 and considered Don’t Do. Either cross them off your list completely or put on the someday or incubation list. The Eisenhower matrix can help you figure out what matters most to you. Once you’ve completed the brain dump, and you know what your important items are, then you create your next weekly log using last week’s unfinished tasks that are worth migrating, and the priorities from your brain dump. As part of the weekly review, you also check your inbox and get it to zero, and look at Current, Someday, and Incubation projects. Here’s how that looks in my bullet journal. The Daily log serves as a daily next actions list and calendar. It helps you remember important dates, meetings, appointments so you have fewer things slipping through the “mom brain” cracks. It helps keep you from being overwhelmed by showing you the things that you need to do TODAY to move your life forward toward your big picture goals one small thing at a time. The daily log also serves as an Inbox. You know those times when you have a lightbulb moment? The most amazing idea for how to decorate the master bedroom or the solution to the challenge you’re having with your spouse, or you simply remembered that you need to get spray gel at the store? And you know that in order to remember it, you have to write it down (mom brain, remember?). Before the bullet journal, I would just write those things down on whatever piece of paper was handy. But then I had random bits of papers and post it notes everywhere with no real system of how to get those things done or even find what I had written down. No more! Thanks to the bullet journal I know exactly where to quickly write them and find them later. add it to your projects list, or next actions list. Need to flesh out the idea some more, start brainstorming it out or planning on a new page dedicated to it as part of a collection. ***(Remember to note it in the index so you can find it later). Time blocking isn’t part of the GTD system but many people find it very helpful for productivity. Time Blocking is when you divide your day into blocks of time and schedule certain tasks during those time blocks. You can organize it by sequence, but not time specific: Laundry 30 minutes, then, cleaning 30 minutes, finances 30 minutes, current project 2 hours, etc. Or you can be Time specific in your time blocking: from 8-8:30 that’s cleaning, 8:30-9:00 laundry, 9-11 current project. Mondays are Administration and Power hour. That’s when I do tasks like paying bills, budgeting, meal planning, making the grocery list, and spend an hour doing the tasks that I’ve been procrastinating. We also do a family meeting every Monday night. Tuesdays are Food + Project. This is when I go grocery shopping, clean out the fridge, and any bulk food prep for the week. Any other free time I use to work on one of my current projects for the week. Wednesdays are Current Projects Day. I use a chunk of time for focusing on current projects. Thursdays are Cleaning + Laundry. With a family of 7, I try to do one full load of laundry per day, but on Thursdays, I do extra loads to catch up as well as sheets, towels, rugs, etc. I also do mending and ironing as needed on Thursdays. Fridays are Plan + Errands. This is when I set up my next weekly spread, do a weekly review and run errands, like visit the library, non-grocery shopping, etc. Saturdays are Family + Prep days. Laundry, kids chores, yard work, family fun and prepping for the Sabbath on Sunday. Sundays are Spirituality. We go to church, spend time as a family, don’t do any work and check in with the kids’ gospel goals. The GTD system has you divide projects into different types. 1) Current Projects – the ones you are working on now, 2) Someday projects – saved for later and 3) Incubation – projects you’re still deciding on. In the bullet journal, these are housed in your collections. Your collections will vary from bujo to bujo as your life interests change over time. Here’s how it looks in my current journal. A current project is any multi-step task I need to devote time and attend to now. For example: getting family pictures, purging the house of stuff we’ve accumulated, what to do about the 8-year-old’s back talking, how to save money on groceries. Those are current projects. I have a running list of current projects and I try to only actively work on less than 8 at any given time. The others go into my “current projects – up next” cue. Up next – These are the projects that I’ll add to my current projects as soon as I complete something on my current projects list. I write them on my current projects list and mark them as up-next. That way I don’t forget about them. When I’m making a new weekly or monthly spread, I add these as space comes free in my current projects bandwidth. Someday: These are projects that you know you want to do, but the timing isn’t right at the moment. Maybe you have too much going on, or the season of life isn’t the best fit. Whatever the reason that it’s not the right time to do the project, you still want to get around to it one day. That’s what the Someday list is for. Things that you have decided you for sure want to do someday. They can be big things like learning to play the violin, speak Spanish, or take a trip to England. Or they can be small things like making a DIY necklace organizer or find a new favorite lipstick color. Writing them on a Someday List means your hopes and dreams are not forgotten. Each week in your weekly review, you can glance over your someday list and see if the time is now right to bump those onto the current projects list. The incubation list is where you keep a list of the projects of things that you might want to do, but you’re still deciding. For example, you’re considering trying out a capsule wardrobe, or maybe you want to take a watercolor class that the Rec center is offering. Simply note it on the incubation list so you can remember to get back around to thinking about it and decide if that project is really right for you. **I keep a digital copy of these lists too. In my bullet journal, I keep a partial list of only the new items that I want to add to my master Someday and Incubation lists. In my BuJo, it’s just the things that add during the months I am using that particular journal. Making lists in the BuJo keeps them all in one place so you don’t spend time hunting around for them. Here are some types of lists that can help you get your things done. You can use a bullet journal to house your master grocery shopping list. I don’t like to take my BuJo with me inside the grocery store so I have a separate master shopping list. I use my BuJo to quickly jot down things we are running low on throughout the week (I put it on my weekly log). As I do meal planning on Mondays, I will also add items to the shopping list. When I’m planning our dinners, if a recipe calls for something I don’t normally keep on hand, I add it to the list on the weekly spread. Then I either add it to the master shopping list but usually, I just snap a quick picture of it and use my phone in the store. When it’s time to change out seasons or the kids are just growing out of their clothes, I find it helpful to make a list of the specific clothing items they need, as well as sizes. That makes shopping easier and less expensive since you’re only shopping for things you’ve decided on in advance. Less impulse buying. Also, Christmas gift and Birthday gift idea lists are great in the BuJo too. Lists help you to be better organized when life gets crazy. In Sept 2017, we were living in Antigua when Hurricane Irma started making her way across the Atlantic Ocean headed directly for us. She was one of the strongest and largest hurricanes in recent history growing rapidly to a category 5. Each day as she got closer and closer, I got more and more anxious. I had never been through a hurricane before. I had no idea what to expect. We had about a week to prepare the best we could to face the storm. The normally relaxed and go-with-the-flow islanders were busy as bees boarding up windows, trimming trees, securing power lines, removing coconuts, avocados, papaya, and anything else that could become a projectile when the winds started. All the locals got a haunted look in their eyes as they remembered the devastation caused by the last category 5 storm to hit the island and living through the aftermath. It was scary and a little overwhelming. I coped by making lists of what needed to be done and working through the lists. That helped me stay focused on a task instead of freaking out. When I talked to my neighbors and they said that the last hurricane they had 18 inches of water inside on the ground level of their house, I knew we needed to get as much off the floor as possible. When the other neighbor said to put everything in plastic bags because with the winds and rain everything gets wet, I bought garbage bags and put almost everything we own in them to protect it all from moisture. When my friends told me the power was out for months after the last category 5 hurricane hit the island and to stock up on peanut butter and crackers and other things that don’t have to be refrigerated, I made lists and went shopping 3 times in 5 days. I found batteries and flashlights. When we decided to weather the storm from another (hopefully safer) location on the island, I listed what we needed to pack up and take with us and then got to work. By a miracle, the storm took a slight course northward right before it reached us and Antigua had minimal damage from Hurricane Irma. Our sister island Barbuda, 30 miles to the north was completely devastated. Every person had to be evacuated off the island and brought to Antigua. But that’s another story. This one is to say that I am grateful for my bullet journal that helped me better manage a stressful situation and now serves as a memory and record of that time in our family’s life. Headed out for travels? Create a packing list in your bullet journal. Be sure to note it in your index and you can reuse the list again and again. If your packing list is the same for different trips, there is no need to make a new list in each BuJo. You can reference old journals for lists there. For example, if you make a summer camp packing list in your BuJo this year, you’ll note it in the index so it’s easy to turn right to it and reference it to pack for summer camp again next year. Another list that can help you be productive is a login/passwords lists. Instead of spending a bunch of time searching for passwords, you can write them all down in one place in your BuJo. Of course, this is not the most secure way to keep your logins/passwords, and I don’t really recommend it, but still, it’s an option. These days, I keep all my contact information digitally stored on my phone. But I learned its also a good idea to have a written copy. Last Halloween, my 8-year-old daughter was invited to go trick or treating with a new friend. It was a really big deal because Antigua doesn’t celebrate Halloween, and she was so excited. A friend of the friend had organized a party that included trick or treating to a few neighbor’s homes which had been pre-arranged. I went to the beginning of the party but then had to leave to take my older daughter to a different activity. My 8-year-old was to come home with her friend and her mom, whom I didn’t know very well. I realized then that while we had lived in the area for a little over a year and I didn’t have a single phone number written down for anyone else local because I just put everything in my phone. As it got later and later, I got more worried. At about 10:30 they arrived home safe and sound. Lesson learned. After my phone revived back to life the next day, I wrote down a bunch of phone numbers in one of the back pages my bullet journal, just in case. A routine is a string of habits on autopilot. Routines are the secret sauce to a productive life. They really are. I know this is true. But I am also crappy at routines. When it comes to routines, I would rather just do whatever is calling to me at the moment than stick with the plan. This gets problematic for productivity. But I am learning to build better daily routines one small step at a time. And it’s definitely less chaotic than having no routines. My BuJo has been my accountability partner for this. In a BuJo you can list your ideal daily, weekly or monthly routines. Remember, this is the ideal schedule. You’re probably not going to get everything done on it every day, because #reallife happens. You don’t even have to follow it, but it helps to know what your ideal day looks like. So, take a look at that ideal schedule and choose JUST ONE place that you think is holding you back the most. Start there. Hook it to one habit that you already easily do (like brushing your teeth, or eating lunch). And write it down on your weekly or daily log. Do those two things one after the other until it becomes a habit. Then repeat the process adding a third thing. And repeat again. You’ll be amazed at how soon you are accomplishing so much more but with less effort. So there you have it. 17 ideas how to integrate GTD and other productivity methods with the bullet journal system to get the right things done. Brain dump everything for clarity. Run your brain dump items through the Eisenhower Matrix to prioritize. Make Lists to Be More Organized– grocery lists, clothing needs, birthdays, Christmas, packing, whatever is currently going on in your life, logins and passwords, contact numbers. Routines are the secret sauce of productivity. Start adding JUST ONE thing to your routine. Over time, you’ll be accomplishing a lot more with minimal effort. And remember, whenever you are rewriting anything for a second or third or tenth time, ask yourself “is this still worth my time?” and you’ll be getting the right things done for you! 1. Do a brain dump and clear your head. 2. Choose the one most important and urgent thing from your brain dump. 3. Determine the very smallest next action you can take to move that one item closer to completion. And I really do mean the very smallest. Remember, baby, baby steps will get you there. 4. DO that one next action today. How do you use your Bullet Journal to be more productive? What would you add to the list? Let us know in the comments. Great post. I love that your Bullet Journal is more functional than decorated. I feel like people have just taken the Bullet Journal and ran away from the original intent of it which was to simplify organizing and tracking the things you have going on in your life. There are so many great tips in the post! Thank you so much for sharing! Thank you! The Bullet Journal is such a great system and I hope to help others see that you don’t need to be artistic or make it beautiful for it to work for you. Thank you so much for this. I’ve been trying to figure out how to make the two – BuJo and GTD – work together, and this has been the best way I’ve ever seen. I spent the last week working with it, and man, does it HELP! Thank you so much for sharing this.